15 Feb 2015 Washington, D.C. The Islamic State terror group released a video on Sunday showing the Islamic jihadis beheading 21 Egyptian Christians who were previously kidnapped in Libya. 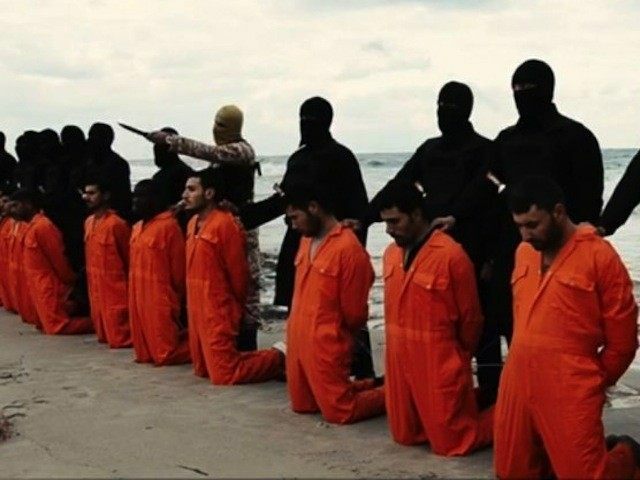 The Egyptian Copts, who were dressed in prisoner-like orange jump suits, were lined up along a beach and abruptly beheaded in the graphic five-minute video. “All praise is due to Allah the strong and mighty,” said an ISIS jihadist dressed in military fatigues in American-accented English. “And may blessings and peace be upon the ones sent by the sword as a mercy to all the worlds,” he added. Oh people, recently you have seen us on the hills of Al-Sham and Dabiq’s plain, chopping off the heads that have been carrying the cross for a long time, and today, we are on the south of Rome, on the land of Islam, Libya, sending another message. All crusaders: safety for you will be only wishes especially if you are fighting us all together. Therefore we will fight you all together. The sea you have hidden Sheikh Osama bin Laden’s body in, we swear to Allah we will mix it with your blood. After the ISIS leader finishes speaking, his fellow terrorists then commence the beheading of the 21 Egyptian Christians. “And we will conquer Rome, by Allah’s permission, the promise of our Prophet, peace be upon him,” The militant leader says after his comrades slaughter the Christian hostages. Egyptian President Abdel Fattah el-Sisi immediately brought in his national defense council after being notified about the brutal murder of the twenty-one Egyptians. “It is with deep sorrow that President Abdel Fattah el-Sisi mourns the Egyptian victims of an abhorrent act of terrorism in Libya and offers his deepest condolences to the Egyptian people for their grave loss,” said a statement from the Egyptian president’s office. Libya has largely fallen into a state of civil war and complete lawlessness following the U.S.-led effort that ultimately deposed its late autocrat Muammar Gaddafi in 2011. Islamist militias, some of which have pledged allegiance to the Islamic State, have been fighting fierce battles against the forces of secular, anti-Islamist Libyan General Khalifa Haftar.